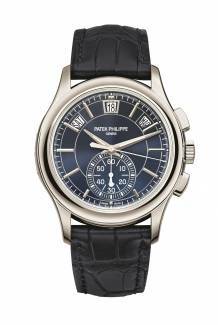 Many hotels offer unrestrained levels of luxury but seclusion is harder to come by. 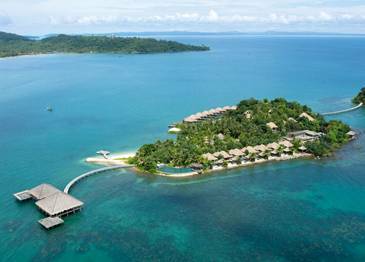 To get the best of both worlds, you'll need a hotel on a remote island. Standing in splendid isolation off the coast of Newfoundland, with a population of just 2,500 hardy souls, the remote island of Fogo feels like a place lost in time. And yet this windswept isle is fast becoming the spot du jour, thanks to locally born tech-millionaire Zita Cobb, who’s made it her mission to revitalise the island’s struggling economy. 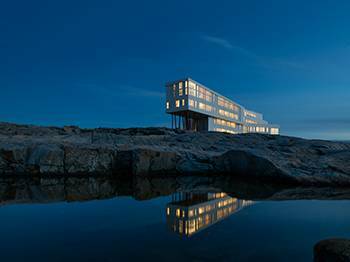 At the centre of this endeavour is the architecturally stunning 29-room Fogo Island Inn, a building constructed entirely by local hands and set on stilts to echo the area’s traditional fishing stages. Massive expanses of glass draw the outside in — a particularly dramatic and otherworldly sight in the beautiful and often severe Canadian winters — while wood-burning stoves in the rooms, star-gazing hot tubs on the roof and sunny staff at every turn ensure that you’ll never feel the chill. 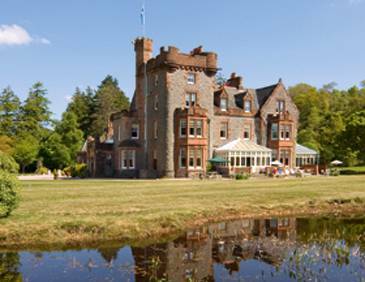 A baronial pile set on a 300-acre private island estate, the Isle of Eriska is blanketed by forest and well-hidden from public view, but has gained a reputation as one Scotland’s most exclusive hideaways. As well as being able to kick back in hot tubs, locking eyes with Loch Creran and the Isle of Lismore, guests can fish and hunt on the estate, eat locally sourced and lovingly prepared food, play golf, enjoy the ESPA spa, go hill-walking or rub noses with the local wildlife — the portly badgers who visit the hotel terrace every evening for milk and brown bread are a star attraction, but waiting in the wings to be discovered there are also baby-eyed seals, hand-holding otters, elegant red deer and soaring golden eagles. If you’re looking for a luxury private island retreat that can do it all, then head to Peter Island in the bright-blue waters south of Tortola in the Caribbean. Family-friendly, romantic, activity, spa getaway — you name it, it’s all here. Service is top-notch and the sweet gelato-coloured villas tangle perfectly with the wild landscape. And there is every amenity you could ever need: five palm-fringed hammock-strung beaches, water sports galore, four tennis courts, an Ayurvedic spa — and even a helicopter on standby for island tours. To top it off, the island is bursting with history and character; this is where Blackbeard is said to have marooned his crew, and where Robert Louis Stevenson drew inspiration for Treasure Island. Its name translates as “The Sweethearts” and here conservation and finely tuned luxury walk hand in hand. 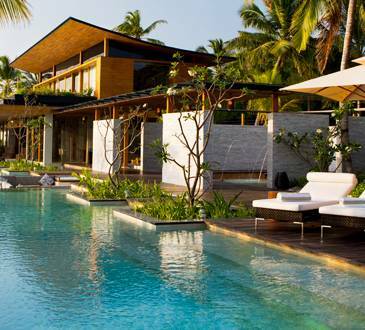 Grand villas moulded from salvaged stone and teak are found amid ficus and frangipani trees or dotted over the ocean. They come with driftwood furnishings, glowing plunge pools and hypnotic marine reserve views. Guests can visit the hilltop ila spa with its dreamy treatments and meditative decks reclaimed from colourful old fishing boats. Or you can dine in barefoot restaurants, where chef Neil Wager serves refined Mediterranean and Khmer dishes while exotic hornbills hover overhead. Or visit local villages, kayak through pristine mangroves, or dip in Disney-esque bioluminescent waters. Whatever you choose to do, a clear conscience is guaranteed; along with top eco-credentials, the hotel’s takings are the backbone of a thriving micro-economy in the area. 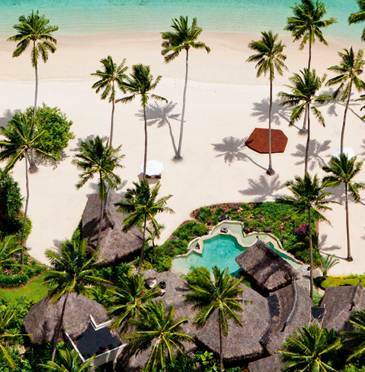 A shimmering fleck of land east of Taveuni, Fiji, owned by the Red Bull billionaire Dietrich Mateschitz, Laucala is the stuff that holiday dreams are made of. Volcanic mountains wrapped in ribbons of ginger and jasmine-scented rainforest are hemmed in by curly mangroves, fingers of coral and bone-white sands. 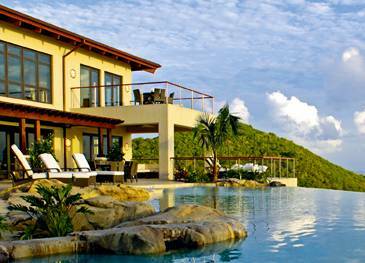 The 25 villas have arching thatched roofs, designer chairs woven from seagrass and bathtubs cleaved out of solid stone. And it’s not just the architecture that’s organic; fruit and vegetables are grown on site, while chicken and pigs are reared for meat. There are restaurants and bars, a wedding chapel, an 18-hole golf course, a riding centre, four-room spa and a million-dollar submarine. Haloed by ice-white sands and gin-clear waters, Coco Privé is the only island in the Maldives that you can have entirely to yourself. On this slice of paradise, you won’t find a restaurant or a cocktail bar or a souped-up water-centre — just one furiously stylish master residence orbited by five fabulous guest suites. Days can be spent flitting between the ocean-facing spa, the infinity pool and the kaleidoscopic shore with its leathery green turtles, swishy blacktip reef sharks and sinuous manta rays. Later, under dazzling starlight, ninja-silent staff materialise with silver ice buckets, fruity hookahs and zingy meals prepared by the brilliant chef. Even Greta Garbo never had it this good.